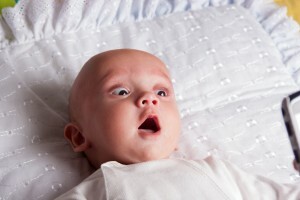 TSK (That Special Kid, or your baby) has many emotions! As a parent, you can learn to recognize your TSK’s emotions, and that will help you know what to do! Every baby is different, and will express emotions in his or her own special way. Emotions are necessary for us to survive and often lead into other emotions. For example, TSK might be surprised, then fearful, then angry and finally joyful after you have comforted him to make him feel safe. Emotions and stress go together! When we feel fearful or anxious our bodies make a chemical called Cortisol, or the stress hormone. Cortisol works quickly to give us extra energy and make us more alert. If Cortisol is activated a lot it wears the body down and can cause us to get over weight, not sleep well and get diseases like high blood pressure, heart disease and even contribute to arthritis and diabetes. Good stress – we all need a little stress- it helps us to be alert and to do our best but it shouldn’t last long, and we need to be able to rest from it. Bad stress– this happens if we have too many of the negative emotions (see below) and they last too long. These can happen if we are in situations with violence, not able to eat healthy foods, not able to sleep well, and not in places where people get along well and love each other. Tolerable stress – this occurs when the Good stress almost turns into Bad stress, but parents can stop it before it causes the bad problems from too much Cortisol.